After lukewarm response to his proposed Federal Front from West Bengal Chief Minister Mamata Banerjee and her Odisha counterpart Naveen Patnaik, TRS supremo K Chandrasekhar Rao is in Delhi hoping that his proposed meeting with BSP chief Mayawati and Samajwadi Party president Akhilesh Yadav will help his effort to prop up non-BJP non-Congress alliance for the next year’s Lok Sabha polls. Sources said KCR is expected to meet Mayawati and Akhilesh on Wednesday, but so far the meetings are not confirmed. While Mayawati is in Delhi, SP sources in Lucknow said Akhilesh has not yet planned any visit to Delhi. It is interesting to watch the moves of KCR as his counterpart in Andhra Pradesh and TDP supremo N Chandrababu Naidu is also meeting Opposition leaders as part of his effort to form an anti-BJP grand alliance that will also include the Congress. KCR is in the national Capital to also call on Prime Minister Narendra Modi and other Union Ministers to talk about issues related to Telangana where he retained power last week. The Congress which is spearheading an assortment of Opposition parties, including the BSP, SP and TMC, has accused the TRS of being a BJP agent and feels that his proposed front cannot rescue the BJP as the front constituents will State specific anti-BJP alliance. Criticising the TRS chief’s efforts to forge a Federal Front of regional parties, the Congress said it is an attempt to help the BJP return to power after the next general elections. Claiming that the Chief Ministers of different States, whom KCR met would not fall for the idea of a third front, as the leaders of regional parties would join a broad coalition with the Congress, leaving only TRS in the Federal Front. “KCR’s attempts to rope in regional parties and State Chief Ministers to be part of the Federal Front will only help the BJP,” said Congress leader Rajeev Gowda. Gowda further said the Congress would ensure that a mahagathbandhan (grand alliance) was formed with all regional, secular and progressive parties. “This federal front idea... The truth behind it is nothing but an attempt to ensure that BJP and ‘Modi Sarkar’ come back to power,” he alleged. Meanwhile, reports from Hyderabad said even as KCR’s mission to bring regional parties together to form a Federal Front reached New Delhi after passing through Bhuvaneshwar and Odisha, it was clear that the leaders whom he met so far have not made any direct commitment about their future course of action. According to the sources in TRS, both Naveen and Mamata remained non-committal about the stand they would take on the formation of a front which will not involve the Congress. 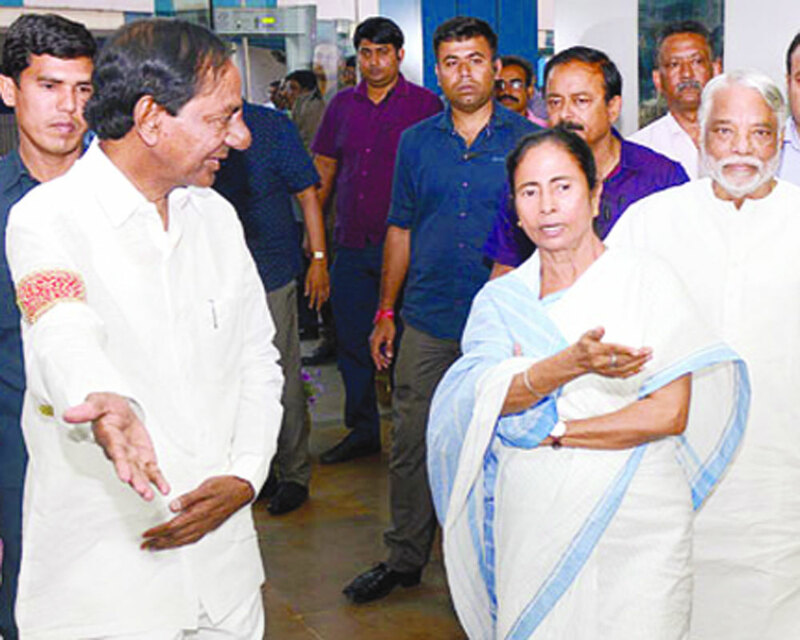 Significantly, Mamata did not make any comment after meeting KCR in Kolkata on Monday. It was only KCR who promised that a concrete result of the deliberations will come out soon. Sources said while KCR repeatedly asserted the need for all the regional parties to come together and offer an alternative to both the Congress and the BJP, the other regional leaders indicated that they would like to wait and watch till the 2019 polls were over. “Some of the leaders want to keep their options open till after the elections and take a final decision depending on the election results,” sources said. “At the moment it appears that any third front or Federal Front will have to wait till the elections are over. At best it would be a post-poll arrangement, not any pre-poll alliance,” said a TRS leader. Meanwhile TRS member of Parliament Vinod Kumar said the idea of Federal Front is not new as KCR had thought about it back in 2006. “Both NDA and UPA are seeking to rule the country on their own while KCR wants that the power should be in the hands of the regional parties to meet the aspirations of the people”, he told the media. “If the regional parties had responded positively back in 2006, Telangana State would have become a reality then only,” he said.